Chillies add a ton of flavour to dishes. Besides adding a vibrant colour, it also increases appetite. It is cheap and easily available all over, making it a popular food of peasants who have Rotis with raw onion and Chilli. It has been regularly used throughout India for its antibacterial qualities. This recipe is a hit at my place and is a regular affair. Easy to make and yummy to eat. I have used Bajji Chilli which is not hot. Heat oil in a pan. Add Jeera/ Cumin. Add the cut Chilli pcs and roast for 10 Mins on medium flame.Add Besan and roast till the raw smell of besan is gone. Add peanut powder, garam masala, chaat masala. Roast for 5 to 7 Mins. Add salt and mix well. Switch off the flame after 5 mins. Garnish with fresh coriander, sprinkle roasted flaxseeds and serve hot. 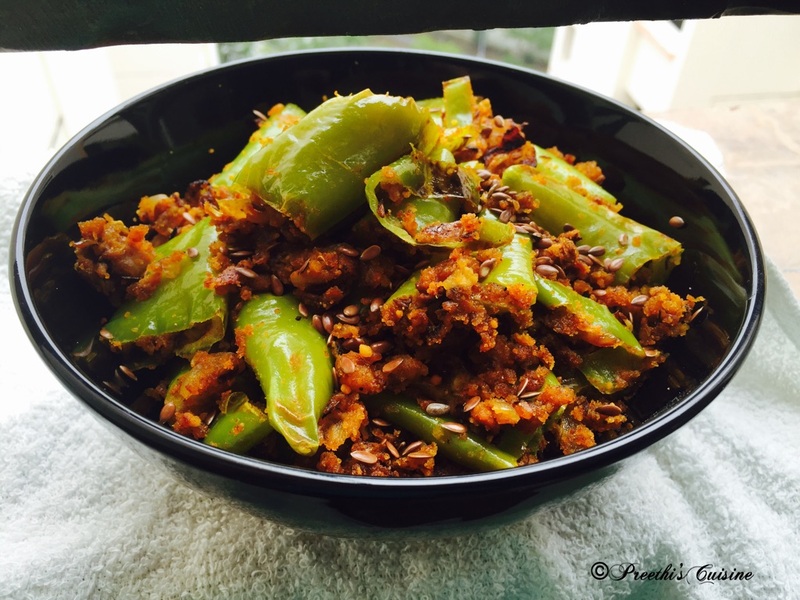 This sabzi goes well with rice , phulkas and with cocktails too. That’s cool.. We always have plenty of chillies in the fridge and when there is lack of vegetables we can make use of these chillies!! Nice idea.. Yummy with rice, isn’t it? Thanks Seena. Yes it is yummy. Thank you. 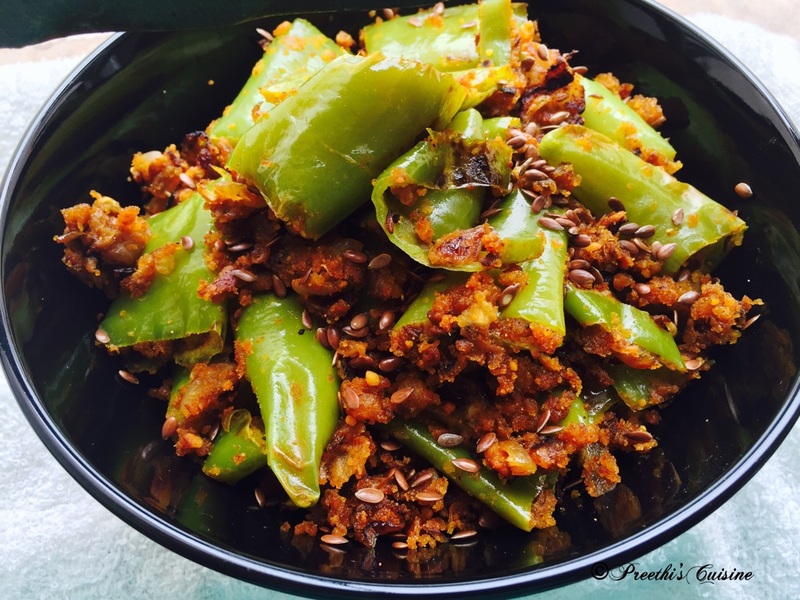 Do give your feedback whenever you try this recipe. 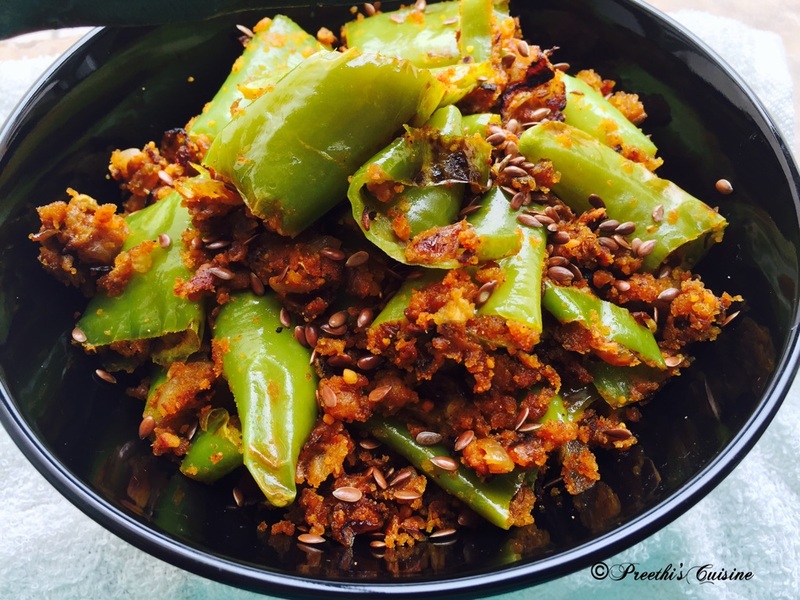 This recipe reminds me of the mirchi sabji my chachi use to make..I think she hasn’t made it in a long time. Simple to make and so tasty, I like how you try to add flax seed powder wherever possible.